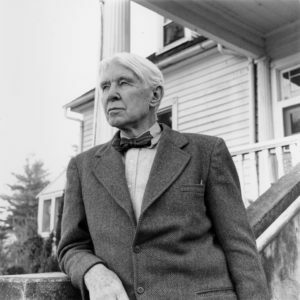 Carl Sandburg (1878-1967), a “Poet of the People,” found his subject in the people and landscape of America; he found his voice in the vivid, candid economy of the American vernacular. He worked his way to a rugged, individual free-verse style that spoke clearly, directly, and often crudely to the audience that was also his subject. His poetry celebrated and consoled people in their environments—the crush of the city, the enduring solace of the prairie. Carl August Sandburg was born in Galesburg, Illinois. He was the second child and first son of the hard-working August and Clara Sandburg. His story traces the life of a young man leaving school at the age of thirteen and later establishing himself as a writer, poet, social activist, and folk singer. At seventeen, he traveled west to Kansas as a hobo. He then served eight months in Puerto Rico during the Spanish-American War. While serving, Sandburg met a student from Lombard College who convinced him to enroll at Lombard after his return from the war. Sandburg worked his way through school, where he attracted the attention of Professor Philip Green Wright, who not only encouraged Sandburg’s writing, but paid for the publication of his first volume of poetry, a pamphlet called In Reckless Ecstasy (1904). While Sandburg attended Lombard for four years, he never received a diploma (he would later receive honorary degrees from Lombard, Knox College, and Northwestern University). After college, Sandburg moved to Milwaukee, where he worked as an advertising writer and a newspaper reporter. While there, he met and married Lilian Steichen (whom he called Paula), sister of the photographer Edward Steichen. The Sandburg’s soon moved to Chicago, where Carl became an editorial writer for the Chicago Daily News. Harriet Monroe had just started Poetry: A Magazine of Verse, and began publishing Sandburg’s poems, encouraging him to continue writing in the free-verse, Whitman-like style he had cultivated in college. The poems’ homely speech distinguished Sandburg from his peers. He established his reputation with Chicago Poems (1916), and then Cornhuskers (1918), for which he received the Pulitzer Prize in 1919. Soon after the publication of these volumes, Sandburg wrote Smoke and Steel (1920), his first prolonged attempt to find beauty in modern industrialism. With these three volumes, Sandburg became known for his free-verse poems that portrayed industrial America. In the twenties, he started some of his most ambitious projects, including his study of Abraham Lincoln. From childhood, Sandburg loved and admired the legacy of President Lincoln. For thirty years he sought out and collected material and gradually began the writing of the six-volume definitive biography of the former president. The twenties also saw Sandburg’s collections of American folklore, the ballads in The American Songbag and The New American Songbag (1950), and books for children. These later volumes contained pieces collected from brief tours across America that Sandburg took each year, playing his banjo or guitar, singing folk songs, and reciting poems. In the 1930s, Sandburg continued his celebration of America with Mary Lincoln, Wife and Widow (1932), The People, Yes (1936), and the second part of his Lincoln biography, Abraham Lincoln: The War Years (1939), for which he was awarded the Pulitzer Prize. In 1945 he moved to a farm in Flat Rock, North Carolina, known as Connemara. Here, while he wrote and published, his wife Lilian raised champion dairy goats. While at Connemara, he published and received a third Pulitzer Prize for his Complete Poems in 1950. His final volumes of verse were Harvest Poems, 1910-1960 (1960) and Honey and Salt (1963). Carl Sandburg died at home on July 22, 1967. Courtesy of Our State magazine.